Depending on the application, metalworking fluids (MWFs) can vary in chemical composition and therefore in the overall hazard they may pose to workers. It’s important for any metalworking company to evaluate, for every MWF being used, the protection in place to prevent injury from MWF exposures. Here we focus on common concerns regarding MWFs, and related safe work practices. • Irritant dermatitis, the most common type of skin problem due to MWF exposures. Some solutions can remove the protective oils in the skin, damage the natural skin barrier and cause dry, inflamed skin particularly on the hands and arms. Small cuts (from metal chips, for example) can exacerbate these problems, increasing the potential for dermatitis. • Allergic dermatitis—Fluid additives such as corrosion inhibitors, preservatives, biocides and amines can cause an allergic reaction. Damaged skin allows these additives to enter the body more easily, and workers can develop sensitivity and allergic reactions from even slight exposures to these chemicals, even when the worker is a from his job. • Oil acne and folliculitis—MWFs such as straight oils can cause oil acne and can, over time, inflame the skin follicles on exposed skin. In combination with poor industrial hygiene and heavily contaminated clothing, these fluids can increase irritation to the neck, hands, arms and thighs. MWF mists and vapors can increase the risk of workers developing work-related asthma, respiratory-tract irritation and breathing difficulties. Prolonged respiratory exposure to fluids combined with worker lifestyle choices, such as tobacco smoking, can lead to greater sensitivity and respiratory illness. Airborne exposures also may increase irritation to the eyes, nose and throat. • Workers are stationed near the metalworking machines during the entire workday. • Conduct an air-quality test to check MWF mist concentrations. • Provide splashguards on machines. • Properly maintain MWFs by keeping correct concentrations and pH. 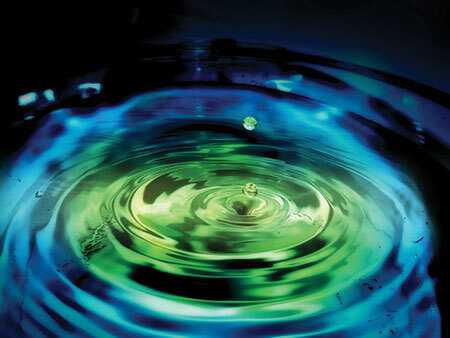 • Use appropriate biocide additives to control microbial organisms. • Minimize production of mist by controlling the volume and flow rate to cutting tools. • Use enclosures or ventilation to remove any mist being generated. • Keep work areas clean and practice good industrial hygiene. • Als wear clean clothes and launder any clothing contaminated with MWFs. • Wear personnel protective equipment such as splash aprons and nitrile gloves where appropriate. • Perform frequent hand washing to remove fluids, and never use a solvent to wash skin. • Keep skin moisturized during the work day. • Use a skin-barrier cream if needed. Case 1: A shop specializing in weldment repair and rebuilding of small machine parts was found liable for fatal injuries to an employee who had been operating a mechanical power press. The press camshaft, which had been repair-welded by the shop, fractured during normal production use. This caused the press to double-cycle when the operator reached into the die area to adjust the tool adjustment. The settlement against the machine shop exceeded $2 million. Case 2: The manufacturer of a shear pin for snow-blower augers paid $975,000 in a product-liability lawsuit. The pin failed to break when the auger sent a large chunk of ice through the chute and into the owner’s face, resulting in severe injuries. The pin manufacturer had no quality-control procedures or records to verify the strength and failure points of the pin, which the snow-blower manufacturer had contracted to have designed and produced. As a manufacturer, you’ve come to appreciate the value of producing a quality product, and staying competitive means controlling your costs and risks. One of the major risks manufacturers face involves the threat of product-liability lawsuits, much like the previous scenarios. These lawsuits can have a devastating impact on your company’s reputation and survival. The best to avoid lawsuits: A commitment to product safety. Although operations, product types, users, etc., may differ, each company needs a plan to ensure it manufactures safe products, which will ultimately help to preserve its business assets, quality reputation and customer base. • Failure to take corrective action when defects or problems are discovered. To help minimize the occurrence of product-liability claims, manufacturers should anticipate, control and eliminate any potential problems in design or manufacturing processes. Do you have the basis for a proactive product-safety program? Is it designed to control foreseeable risks to your company and to the users of your product? • Experience level of auditor and their understanding of product-safety principles. 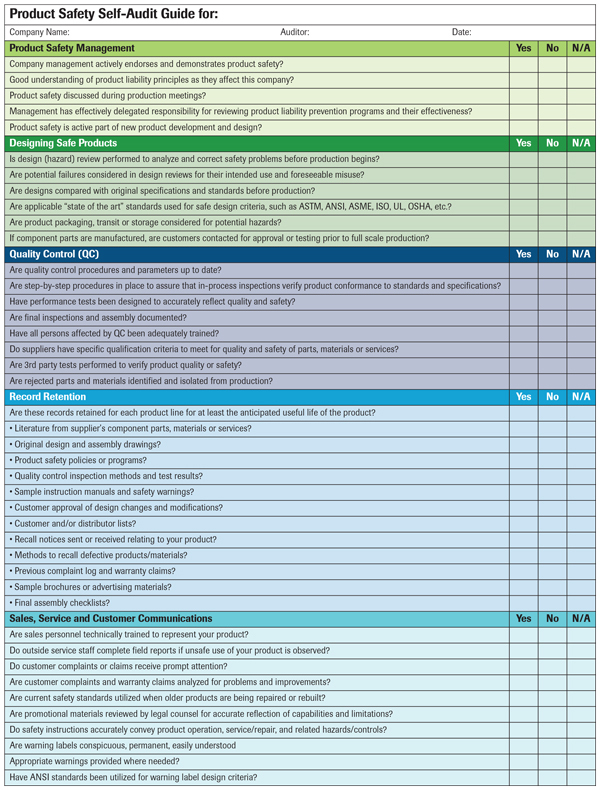 A product safety self audit guide will help with identifying and improving weak points and overall product safety. A sample of the guide is available. Note that there are some elements that may not apply to your operations, for which a response of “N/A” would be appropriate. You also may find that other elements need to be addressed in addition to this list.